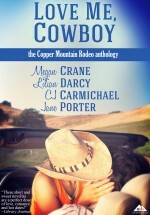 Boss/Secretary, Cowboy Hero, Fake Relationship, Good Girl/Bad Boy, Meddling Relatives? Follow Megan's Please Me, Cowboy board on Pinterest. Just finished this wonderful book by Megan Crane, one of my favorite authors. If not yours, then you’re in for a real treat. A lesson in the fact that love always finds a way!! …You just want it to go on and on!! Be sure to read this one!!! The tension between this couple is palpable. I flew through this book and was antsy to turn every page. Great read and I really recommend this one! I’m looking forward to reading more by Megan Crane… I recommend this series to anyone who enjoys great romance.